NetGreen Consulting, Inc. - News and Updates | NetGreen Consulting, Inc.
It’s tough to open a new local steakhouse and compete against national chains! 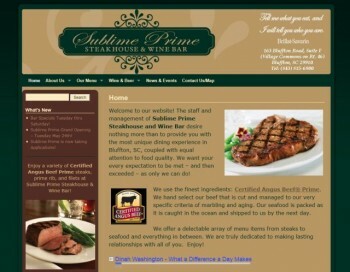 Karyn Goldberg, the owner of the new Sublime Prime Steakhouse & Wine Bar in Bluffton came to us for help in developing a website that projects their fine dining image and brings in visitors – and we have succeeded! The website features their Certified Angus Beef entreés as well as their extensive wine list, and it incorporates images, video, audio, and a Google map for driving directions along with their menu and a contact form. This site was built using a WordPress platform with a number of plug-ins that add needed features. We also installed Google Analytics tracking code, and the reports show that our SEO efforts have paid off as well – visits to the site have been almost doubling every week since they opened on May 24th. Their website had 167 visits over the week of June 13 – 19, and over 80% of them were new visitors! It was our pleasure, Karyn! And we can say from experience that it will be YOUR pleasure to dine at Sublime Prime! They are located just south of the Bluffton Post Office in the Village Commons on Rt. 46. Her old site had been sitting unchanged for years and she had no way of updating it. We worked with Sharon to incorporate a new photo gallery of her design work (actually TWO photo galleries!) and information about her ASID and Green AP certifications into a new layout for her site. She wanted a layout using earth tones that still had a touch of simple beauty to it. It’s a major improvement over her old site – and now she can update it whenever she wants!